5 How To Install the Official ROM/Firmware via Samsung Kies and OTA (Over The Air) ? 6.1 Phones through PC via Samsung Kies ? 7.1 Samsung Galaxy through OTA (Over The Air)? 8 Installing Official ROM/Firmware N5110UES2CQB1 Android 4.4.2KitKat on Galaxy Note 8.0 (WIFI) GT-N5110 through Odin? 10 Guide to help you in installing Root on Samsung Galaxy Note 8.0 (WIFI) GT-N5110 – N5110UES2CQB1 Android 4.4.2 KitKat. N5110UES2CQB1 Android 4.4.2 KitKat is the new official firmware update (UES2CQB1) for the Galaxy Note 8.0 (WIFI) (GT-N5110) BUILD DATE: 10.01.2017 CHANGELIST: 1498778 (Android security patch level: N/A) and now it is available, and you can download it from Galaxy Rom Website and get help to updating and installing it with our Complete Tutorial. There are several ways to install UES2CQB1 Android 4.4.2 KitKat on your Galaxy Note 8.0 (WIFI) GT-N5110 so, read this tutorial and you will be able to get the new update easily.We recommended that you always update your Android OS on your Android Device because it will improve the performance of your Phone. Read this tutorial carefully and do it at your risk. Galaxy Rom Website Team are not responsible for any damage caused on your Phone, so be careful when you do anything and make sure that you are doing it with the right way. 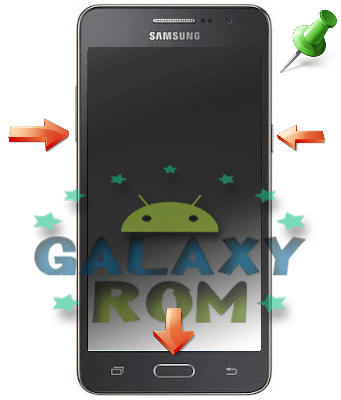 Installation of this ROM/Firmware on your own risk and as we said Galaxy Rom Website Team are not responsible for any damage caused on your Phone. Samsung device. Check your device model and be sure that is matched the same Model here in this tutorial. Go to Settings > About Phone >Model Number. Make a backup for your personal data to avoid data losing. Make sure that your battery is 50% at least before starting the update process. Don’t move or remove the USB cable during the Firmware Installation Process. Attached images are examples only so that you may find some difference, but all steps are same at all. 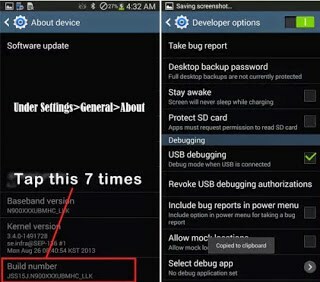 Enable USB Debugging Mode on your Samsung device by going to Developer options ( If you can’t find Developer Options you must show it by going to Settings >About Phone then tab 7 times on Build Number, and you will get message tell you that the developer options are enabled , See the image below). All the above notes are very important, and you must follow them before proceeding the installation process. Samsung kies Download Samsung program kies | Here |. Unzip Program Unzip compressed files program you need to decompress For Firmware files | Here |. ROM/Firmware manually through it | Here |. Remember: that you can download this Official ROM/Firmware for another country and install it on your Phone, but the version must be compatible Samsung rolled out the firmware for the following countries. If you are using any Custom ROM such as- CyanogenMod,Paranoid Android, AOKP, SLIM ROMs etc, Carbon ROM-PACman ROM-LiquidSmooth ROM- Beanstalk ROM- Avatar ROM, Omni ROM SLIM ROM, LiquidSmooth ROM-Carbon ROM … then it’ll replaced by this official Stock ROM Custom Recovery (CWM or TWRP Recovery) will be replaced by Stock Recovery After flashing official firmware, your device will no longer belongs to rooted device. However, you can root your device any time after flashing the firmware. How To Install the Official ROM/Firmware via Samsung Kies and OTA (Over The Air) ? Phones through PC via Samsung Kies ? Be sure that your PC is connected to the Internet, setup the Samsung Kies Utility, and connect your Phone to your PC Via USB Cable. Run the Samsung Kies Utility and it will recognize your Samsung Phone. On Samsung Kies Home Screen, you’ll see a notification say that a “New Firmware Upgrade is available.” If it said that“You have the latest Firmware update” it means that you didn’t have the latest Firmware on Kies yet , So you can check back later, or try flashing this Firmware manually with (Odin). Click the “Firmware Upgrade” to start the update process. Follow the instructions that appear on the screen. After finishing the updating process your Phone will reboot automatically. After the reboot, you can disconnect your Phone from your PC. Samsung Galaxy through OTA (Over The Air)? Connect your Android Phone to a Wi-Fi network or mobile data (Internet) and be sure to have a stable Internet connection (It is not recommended to use Mobile Data because of the high cost). If you have a message “ New firmware update available “ Click OK to start the downloading and installation process. Installing Official ROM/Firmware N5110UES2CQB1 Android 4.4.2KitKat on Galaxy Note 8.0 (WIFI) GT-N5110 through Odin? 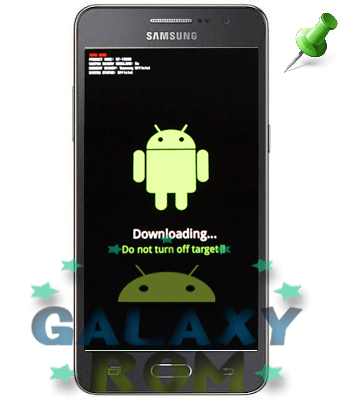 The previous methods for receiving Official ROM/Firmware update N5110UES2CQB1 Android 4.4.2 KitKat on your Galaxy Note 8.0 (WIFI) are the official methods, but most of us doing it with the manual method through the Odin, So the following steps will show you how to do it with Odin program. Install the Samsung USB driver. Unzip the ROM file, and you will have this file with this name G313MLUXXDLJ5_G313MLUODDDLI7_INU.tar.md5 It is the N5110UES2CQB1 Android 4.4.2 KitKat Official ROM/Firmware update for Galaxy Note 8.0 (WIFI) GT-N5110 open Odin. Now we will get into the download mode in your Samsung device. To enter the download mode do the following, Turn off the device and then Press and hold this three buttons (volume down button + Home button + power button). You will have this alert as shown in the following picture, so Press Volume Up button to continue. Press Volume Up button to continue. flashing. You will find a screen like the screen in the following picture. Make sure that the “Auto Reboot” and “F. Reset Time” options only are checked. Phone and also don’t move your Phone or the USB cable to avoid errors ). background as shown in the following picture. It means that the operation completed successfully and now you can disconnecting your Phone safely. N5110UES2CQB1 Android 4.4.2 KitKat on your Phone Samsung Galaxy Note 8.0 (WIFI) GT-N5110. Download Android 4.4.2 N5110UES2CQB1 Firmware for Galaxy Note 8.0 (WIFI) GT-N5110 from the previous download links. pressing and holding the Volume Down + Home +Power buttons(long press until the boot screen appear), now press Volume Up key to proceed to Download Mode. Extract the downloaded Odin3.10.7 zip file and run the Odin3 v3.10.7.exe file as administrator (Right click on the .exe file and click on Run as administrator). Now connect your Galaxy Note 8.0 (WIFI) to your computer via USB cable. In Odin screen, you should see a COM Port number like “0:[COM7]” at ID:COM section and you will find a text appearing in the message box, it means that your device has been detected by Odin. In Odin screen, click on PDA button and select the firmware file with the .tar.md5 extension (You will find the firmware file name looks like something like that :G313MLUXXDLJ5_G313MLUODDDLI7_INU.tar.md5. Now, click on the Start button to begin the installation process, wait for a few moments until the installation process completed. When the installation process is completed, you will see the PASS! message with a green background appears in the ID:COM port. Your Phone will automatically reboot after installation process finishing. You can now disconnect your Phone from your PC safely. Remove the battery from your Phone. Power on your Phone in the Recovery mode by pressing the next three buttons( volume down button + home button + power button ). Now the problem should fixed. Guide to help you in installing Root on Samsung Galaxy Note 8.0 (WIFI) GT-N5110 – N5110UES2CQB1 Android 4.4.2 KitKat. also to root if availability OR you can search in the Rooting category.